"Unable to find a recipe for kale using what ingredients I had on hand, I decided to be creative. Amazingly, it was delicious! I didn't use any salt or pepper and yet the taste was not at all bland. The kale was very tender but not soupy. This will definitely be a go-to recipe for kale." Heat olive oil in a skillet over medium heat; cook and stir onion and garlic in hot oil until onion is softened, 5 to 10 minutes. Stir potatoes into onion mixture and cook until potatoes are lightly browned, 2 to 3 minutes. Stir kale into potato mixture and drizzle in sesame oil. Cook and stir until kale is wilted, about 2 minutes. Stir black beans and sun-dried tomatoes into kale-potato mixture; pour in chicken broth. Simmer soup until potatoes are tender, about 30 minutes. Using the broth this dish can be a soup. Draining the broth it can be a side dish. 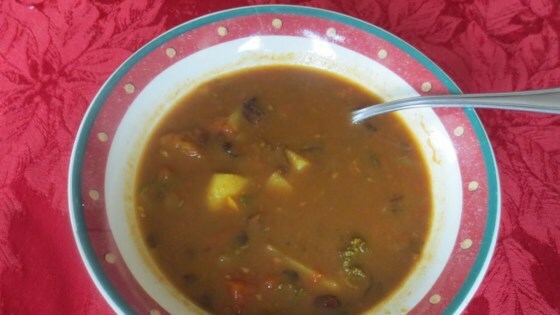 Vegetable broth can be used to make it vegetarian.